The author of the novel Property Values answers eight questions from eight fellow authors. Charles Demers is a Juno Award-nominated comedian and author. 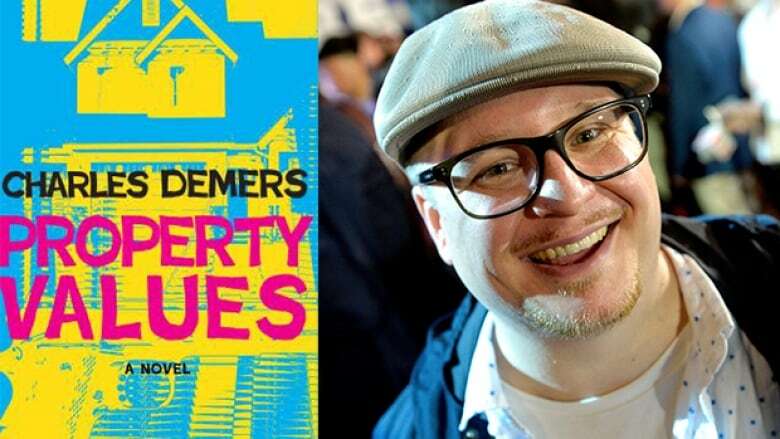 His crime novel Property Values uses comedy to explore themes of urban gentrification, gang violence and the challenges of purchasing a new home in the modern world. Below, Demers takes the CBC Books Magic 8 Q&A and answers eight questions from eight fellow authors. 1. Ian Brown asks, "What was the lowest point in the writing of your latest project? And the highest?" The lowest point for me with every book, almost without fail, is when all the work is done, but you're not holding a book in your hands yet. Invariably, reading what you've written in any format other than a real life book — as an advanced reading copy, or worse, as a print-out or computer file — always makes it feel shabby somehow, and now you've got this thing that you can't improve, but that doesn't feel quite right. The highest point during the writing process was reading the first few chapters out loud to an old friend who is also my neighbour, who would lay down on the couch in my office while I read what I had just written. He was so enthusiastic, and it totally kept me going. As a comedian, I'm used to an immediate feedback loop, and waiting for people to respond to my prose is one of the hardest things for me. 2. Shyam Selvadurai asks, "Do you think the portrayal of certain character types is beyond you? Can you name a character in a novel whose personality, point of view, character traits, etc. you know you could never write?" The two protagonists of the two novels I've ever written have both, like me, lost their mothers — although Scott, the protagonist of Property Values, loses his as an adult, whereas I lost mine as a child, as did Daniel, the main character in my first novel, The Prescription Errors. I don't think this is an accident — the idea of a family with two living, healthy parents has been rendered incredibly exotic to me, and once I conceive of a character as someone who has both, that's almost immediately Othering for me. I'd like to stretch and see if I could do it, empathetically imagining a set of real relationships between a main character and their two dynamic, living parents. 3. Jessica Westhead asks, "Can you clearly remember the one moment — or moments — when you knew you wanted to be a writer?" As a teenager, I was in a radical communist sect, with a Marxist newspaper published in New York that we sold on street corners, and that I sometimes wrote for. There were people who worked on the newspaper full-time, basically for room and board, living leagues beneath the poverty line, making barely subsistence. As I understand it, they had more or less no discretionary income whatsoever. And the idea of that life — living in New York on just enough to live, writing full-time for the revolutionary communist newspaper, was just about the sweetest fantasy I could imagine. So I'd say it was then that I knew I wanted to be a writer. 4. Heather O'Neill asks, "If there were to be a biopic made about your life, which actor would you want to play you? Which director would you choose to direct?" Well, look, I'd want to be played by Idris Elba or Brad Pitt, but I think it's more likely they'd get a pre-weight loss Jonah Hill, and I'd be cool with that too. John Sayles to direct, please. 5. Paul Yee asks, "Do you think it's harder to write funny stories than serious ones?" For me, funniness is a language or a sensibility that I'm almost always working in, so in a way it's easier for me just because it's what's natural. Writing something and saying, "How can I make this funny?" is a really good way to write something that isn't [funny]. It has to be infused atmospherically from the start. But irony can also be a shield, so sometimes it's easier to write something vulnerable if you can make it funny. Then again, ultimately, only funny writing sets a very specific, pass-or-fail criterion for its own success: did you laugh, or at least smile? Serious writing is easier in that way, in the sense that it can "succeed" by dint of a whole range of responses. So can funny writing, but it has to pass that one, clear hurdle first. 6. Anita Rau Badami asks, "What is your relationship with your characters? Is it possible to separate yourself from them or do they always reflect some element of your own psyche?" I think that almost whatever comes from your own life and into a book, once it's written down as part of the story, the story owns it. Then it's not you, and it can't be. So even if parts of a character are drawn from me, or from people who I love, or hate, once they are in the book, they have to abide by the necessities of the story. 7. Russell Wangersky asks, "Which do you like better? The heady rush of the first draft, or the controlled precision of the edits and re-edits? Why?" My favourite part of writing, these days, is outlining — that's where I really feel like I get to have fun spinning a story. But if I have to choose between a first draft and editing, I'd probably pick a first draft, even though each has their good points and tough points. But when you are doing a first pass on a piece of writing, and inventing everything and immersing yourself in the scenario and world that you've created, and you've freed yourself from the strictures of the life that you're in, and get to play in this life or set of lives that you're imagining, I mean… that feeling is really why you become a writer, no? 8. Roo Borson asks, "What would you like to do in writing that you haven't yet tried?" I would like to write a straight-up, fully-functional, working mystery novel. Plot-wise, that just seems to me to be the most technically complex and delicate, with its own set of defined rules, whether for following or breaking. I'd love to write one — or better yet, a series, and get to invent not only these tight little clue-dispensing machines as single books, but to live in the world of a character who continues to live outside of contained stories.